Russia Foreign Minister Sergey Lavrov meets with Tillerson and Trump. Get a load of this transcript. 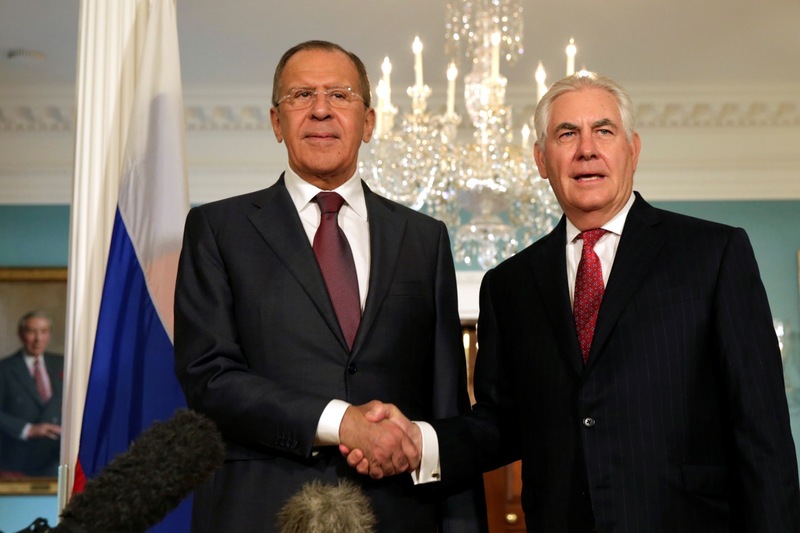 Here is the full and complete transcript of remarks given to news reporters by Russian Foreign Minister Sergey Lavrov and U.S. Secretary of State Rex W. Tillerson, just before Lavrov went into a closed-door meeting with President Donald Trump. Get a load of this nothingburger transcript, and the incredible video in which Lavrov answers a question from NBC reporter Andrea Mitchell about the firing of FBI director James Comey with a sneer, while Tillerson grins silently. This is not the first time Lavrov has responded to this tenacious American journalist's questions with a sneer, nor is it the first time Tillerson sat and grinned wordlessly while the Russian rep dissed our press. Sure is weird, isn't it? FOREIGN MINISTER LAVROV: Thank you. Thank you very much. QUESTION: Does the firing of – (inaudible). SECRETARY TILLERSON: I want to welcome Foreign Minister Lavrov to the State Department and express my appreciation for him making the trip to Washington so that we can continue our dialogue and our exchange of views that began in Moscow with the dialogue he hosted on a very broad range of topics. Thank you. QUESTION: Does the Comey firing cast a shadow of your talks, gentlemen? FOREIGN MINISTER LAVROV: Was he fired? FOREIGN MINISTER LAVROV: You are kidding. You are kidding. Q from @mitchellreports: Does Comey's firing cast a shadow over talks? Russia's ITAR-TASS news agency cameras were let in to Lavrov/Trump meeting today. U.S press was kept out. The Russian press was allowed in. Here's a link to the State Department's video.